The HygroFlex 1 series is an inexpensive HVAC transmitters for relative humidity and temperature. The Room transmitter are equipped with the stable Hygromer® IN-1 sensor, aesthetically pleasing ideal for the office space. 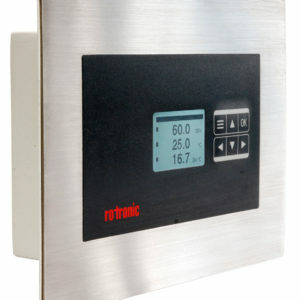 The units comes pre-defined scale which can be change with the optional ROTRONIC HW4/SW21 software, which can also calibrate and adjust the transmitter. The CRP1 Clean-room Panel has a compact construction and simple installation on the wall of a clean-room, using wall-mounted housing. Utilising the Hygro Clip 2 sensors allows humidity to be registered to the highest degree of accuracy. The data can be transferred via analogue outputs or MODBUS. Measured values, alarms and measurement curves are shown on the display. The Clean Room Panel CRP1 is the obvious choice wherever a high degree of cleanliness must be maintained and a precise measurement of humidity and temperature is required. Ideal for clean rooms in hospitals, pharmaceutical industry, electronics or food industries where humidity and temperature are monitored. The HygroFlex 1 series is an inexpensive HVAC transmitters for relative humidity and temperature. The Duct mount transmitter are equipped with the stable Hygromer® IN-1 sensor and boast unbeatable value for money. The units comes pre-configured to a specific scale which can be change with the optional ROTRONIC HW4/SW21 software, which can also calibrate and adjust the transmitter. The Wall mount transmitter are equipped with the stable Hygromer® IN-1 sensor and boast unbeatable value for money. The HygroFlex 1 series is an inexpensive HVAC transducer for relative humidity and temperature. The units comes pre-configured to a specific scale which can be change with the optional ROTRONIC HW4/SW21 software, which can also calibrate and adjust the transducer.